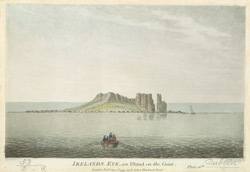 View of Ireland’s Eye- a small island a mile and a quarter off the coast of Ireland. The island is the property of the Howth family but previously belonged to the Archbiships of Dublin. It is made up of approximately 58 acres of land and acts as a breakwater to Howth Harbour. Island’s eye was once known as ‘Inismacnessain’, which translates as- the island of the sons of Nassan; this is the name of a holy order of men who lived on the island in the seventh century.